By: Joyce Hendley, M.S. | January/February 2011 | Chocolate for a Sweet Heart? 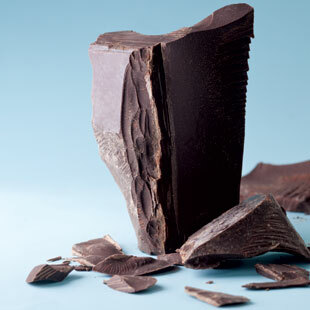 Recent studies confirm that chocolate is good for you: that’s good news for a lot of us! Chocolate to cure a broken heart is a popular prescription, but it turns out chocolate’s heart-mending reputation might just be deserved. A few months ago, Harvard researchers reported that in a study of over 31,000 middle-aged and elderly Swedish women, those who consumed one or two ounces of chocolate a week had a 32 percent lower risk of heart failure than women who ate no chocolate. Similar large-scale studies have suggested that people who regularly eat moderate amounts of chocolate may have lower incidence of high blood pressure, hardened arteries and even strokes. Researchers aren’t sure exactly how chocolate helps the heart, but a likely explanation is that compounds in cocoa called flavanols help activate enzymes that release nitric oxide—a substance that helps widen and relax blood vessels. That allows blood to flow through the vessels more freely, reducing blood pressure. Nitric oxide is also involved in thinning blood and reducing its tendency to clot—lowering, potentially, the risk of stroke. What’s more, some of the key flavanols in cocoa, catechins and epicatechins (also found in red wine and green tea) are known to have heart-healthy, antioxidant effects—such as helping to prevent artery-threatening LDL cholesterol from converting to a more lethal, oxidized form. (While cocoa butter, the fatty part of chocolate, contains some saturated fat, it’s mostly stearic acid, a more benign sat-fat that doesn’t appear to raise LDL levels.) Cocoa flavonols also have anti-inflammatory properties that could protect the heart and arteries, and thus might someday have a role in managing other diseases associated with inflammation and blood vessel damage, such as diabetes and Alzheimer’s disease. If you’re keen to get the most flavanols from your chocolate fix, you might have to do some hunting, since most manufacturers don’t list flavanol content on their product labels. But since the compounds are found only in the cocoa component of chocolate, seeking out cocoa, or chocolate with a higher cocoa content, should theoretically send more flavanols your way. So can choosing dark rather than milk chocolate, which, because of the added milk, contains a lower percentage of cocoa solids. Opt for natural cocoa over dutched cocoa powder as well, since a substantial amount of flavanols are lost when cocoa is alkalized. Of course, all those steps are no guarantee of high flavanols, since manufacturing processes like roasting and fermenting cocoa beans can have a huge effect on flavanol content, too—and those vary widely from brand to brand. Your best bet is to contact the manufacturer and ask. But of course, any positive effects of regular chocolate eating have to be tempered with the reality that it packs plenty of sugary, fatty calories (particularly those added if you’re dosing yourself with chocolate in the form of whoopee pies or Snickers bars). All those extra calories can quickly pile on extra pounds, easily undoing any good those flavanols might have wrought. It’s still better to keep on thinking of chocolate as a treat, not a treatment.